Collins First edition, first impression 1957. 382 pages and well illustrated with photographs. Very Good condition book and Very Good condition dustjacket. The inside is clean and it looks good in its protective wrapper. This book was presented by John Cunningham to Colonel Sir Ernest Guest (1882–1972) who was a Rhodesian politician, lawyer and soldier. He held senior ministerial positions in the government, most notably as Minister for Air during WWII and was involved with the Empire Air Training Scheme. One of his sons was in the RAF and was awarded the DFC before being KIA in 1943. Sir Ernest’s bookplate bearing his family coat of arms and the motto ‘Labore et Honore’ is on the front end paper. 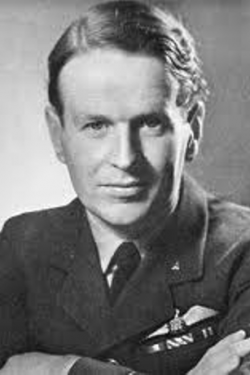 Jimmy Rawnsley served as air-gunner and then as navigator to John Cunningham, the leading night fighter pilot of the Second World War, and remained so almost to the end. 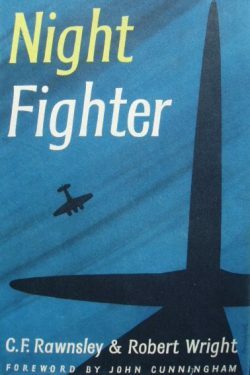 Robert Wright was also a Radar Operator on 604 squadron and this classic book describes their experiences on their night interceptions during and after the Battle of Britain. 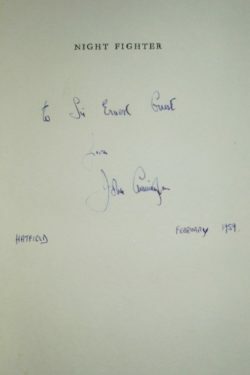 This is the classic account of the night war over Britain neatly signed by the main subject of the book, Group Captain John ‘Cats-eyes’ Cunningham DSO** OBE DFC*, shortly after the book’s publication when he was Chief Test Pilot at De Havilland.